The Grand Mosque in Brussels is the largest mosque in Belgium. The Grand Mosque in Brussels is the largest mosque in Belgium and for almost 40 years it's been run by Saudi Arabia. Now that's coming to an end, over concerns that Riyadh's Salafist influence is breeding radicalism in the community. The mosque is being turned over Belgium's Muslim Executive. One worshiper at the mosque on Wednesday (February 13), denied it promoted radical ideas. "If there's any evidence against the mosque, it would be the sermons themselves. But if you translate them, there's nothing at all to do with terrorism or anything like that". Riyadh has long been a major global exporter of ultra-conservative Islam. After several Islamist terrorist attacks on European soil, some countries are trying to encourage more moderate Imams to lead their Muslim communities. It's the right move, says Khalid Hajji, President of the Brussels Forum of Wisdom and World Peace. 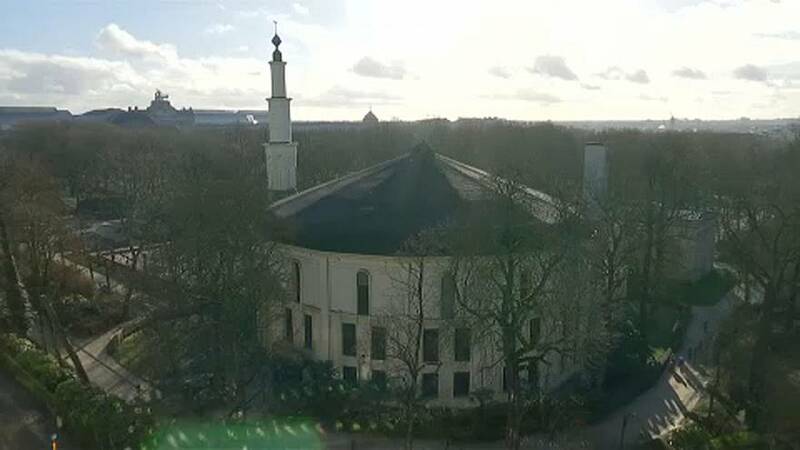 "The mosques needs to update the religious discourse propagated in Belgium and Europe," Hajji told euronews. "The Saudi decision is well-thought out and can be seen within the context of the opening that Saudi Arabia is currently undergoing". The kingdom's apparent willingness to promote a more moderate form of Islam is one of the promises made by Crown Prince Mohammed bin Salman, who is leading a new initiative to end support for mosques and religious schools abroad blamed for spreading radical ideas. Since his appointment in 2017, he has been undertaking major reforms across the country.